(Entertainment Weekly) -- Ben Stiller had no problem handling Christian Bale and an army of robots this Memorial Day weekend. "Night at the Museum: Battle of the Smithsonian" cruised to an easy first-place finish of $70 million over the four-day weekend, according to early estimates by Hollywood.com Box Office. 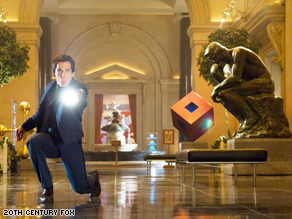 Ben Stiller and the gang in "Night at the Museum: Battle of the Smithsonian" were No. 1 at the box office. The total marks Stiller's biggest opening ever, as the PG-rated comedy clearly caught the attention of families looking for non-violent (and just a wee bit educational) entertainment. 'Smithsonian's' tally also demolishes its predecessor, 'Night at the Museum,' which opened its doors to a $42.2 million gross over a four-day Christmas weekend in 2006. But as impressive as 'Salvation's' earnings may be, it could have trouble in the forthcoming weeks. The film's numbers dropped from Friday to Saturday, a rarity that could signal disappointing word of mouth. Both "Star Trek" (No. 3 with $29.4 million) and "Angels and Demons" (No. 4 with $27.7 million) registered solid results, dropping only 47 percent and 53 percent, respectively, from last weekend. 'Trek,' in particular, is holding up extremely well -- the sci-fi reboot is closing in on $200 million and should take over Monsters vs. Aliens this week to become 2009's top moneymaker. "Dance Flick" rounded out the top five with $13.1 million, which is a respectable outcome for the modestly budgeted spoof movie from the Wayans family. On the indie scene, Steven Soderbergh's "The Girlfriend Experience," starring the adult-film actress Sasha Grey, scored an okay $200,000 from 30 theaters. "Easy Virtue," the 1920s-era romantic comedy featuring Jessica Biel, roared to $146,000 from just 10 theaters for a healthy average of $14,600 per theater. Also, the con-film "The Brothers Bloom" expanded to 52 theaters, stealing $528,000 and averaging just more than $10,000 per theater. iReport.com: What did you think of 'Museum', 'Terminator'? Overall, the box office was up 2 percent compared to last year's Memorial Day weekend, when "Indiana Jones and the Kingdom of the Crystal Skull," despite nuking the fridge, managed to whip up a staggering $126.9 million.